BLACK HAWK senior running back Colby Argall (#12) became the Warriors’ all-time leading rusher during Friday’s game against Highland. He ran for 293 yards and four touchdowns in the game. POSTED October 12, 2018 11:11 a.m.
HIGHLAND – Amidst an already historic season for Black Hawk, senior running back Colby Argall has been rushing his way into the school’s record book. Argall, who surpassed Black Hawk’s all-time leading scoring mark earlier this season, became the Warriors’ all-time leading rusher on Friday night after rushing 23 times for 293 yards and four touchdowns to lead Black Hawk to a 36-12 Six Rivers Conference victory over the host Highland Cardinals on a rainy night at Tyler Field on Friday, Oct. 5. Friday’s victory also assured the #2-ranked Warriors (7-0 overall, 6-0 SRC) at least a share of the conference championship for the second season in a row, which is the first time in program history the Warriors have won back-to-back conference titles. Argall needed just 37 yards to move by former teammate Brody Milz (3,462 yards from 2014-17) as the Warriors’ top rusher. He got those yards and then some as he ran his career total to 3,719 yards with his 293-yard performance. He had touchdown runs of one, five, 43 and two yards on the night along with a pair of two-point conversion runs to run his career scoring total to 408 points. “We’ve had a lot of good running backs over our history. Colby has done a great job these past three seasons with different guys around him. Football means a lot to him and his family, so to see him finish as the all-time leading rusher in school history is a testament to that passion and enthusiasm for the game. He has been a big part of our success the past three seasons,” Milz commented. Argall has rushed for 1,132 yards and has scored 19 TDs and 20 conversions for 134 points. It is his third career 1,000-yard season and his second straight 100-point season. Argall’s first two scores lifted the Warriors out to a 16-0 halftime lead. Black Hawk senior quarterback Kyle Lovelace tacked on a 7-yard TD run in the third quarter to extend the lead to 22-0, but the Cardinals (4-4, 2-4) weren’t about to go away without a fight. Highland QB Spencer Linscheid teamed with senior running back Drew Hennessey on a 20-yard scoring strike to put the hosts on the scoreboard. Argall answered back with a 43-yard TD jaunt and added the conversion to put the Warriors ahead 30-6. The Highland duo switched places with Hennessey tossing a 10-yard TD pass to Linscheid to bring the score to 30-12 by the end of the third quarter. Argall capped his big night with a 5-yard TD run in the fourth quarter that sealed the Warriors’ victory. The Warriors finished the night rushing for 373 yards on 40 carries. Senior Mitchell Quinn added 40 yards on six carries and Lovelace tallied 25 yards and a score of seven totes in the game. Argall completed the Warriors only pass of the night for 12 yards and he added an interception on defense along with three tackles. Rece Shelton led the team with 13 tackles, while Quinn tallied nine tackles and forced a fumble and Gunner Foecking added nine stops along with three of the Warriors’ 10 tackles for loss. Linscheid went 11-of-23 passing for 123 yards with a TD and an interception, and he added one catch for 10 yards and a TD to lead the Cardinals. Hennessey ran 11 times for 49 yards, caught four passes for 43 yards and a TD and completed two passes for 24 yards and another TD. 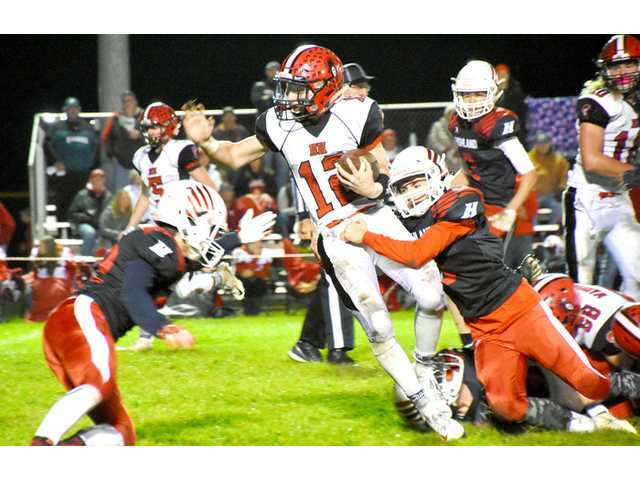 Black Hawk looks to put the finishing touches on an outright Six Rivers Conference championship on Friday, Oct. 12, when they head to Shullsburg’s Badger Park to face the Miners (3-5, 1-5) in their regular season finale. Kickoff is set for 7 p.m. Team Stats: First Downs– BH 11; HI 11. Rushing– BH 40-373; HI 30-84. Passing– BH 1-2-0, 12; HI 14-30-1, 167. Fumbles-Lost– BH 0-0; HI 1-1. Penalties– BH 5-20; HI 3-25. BH Individual Leaders: Rushing (Att-Yds-Td)­– Colby Argall, 23-293-4. Passing (Comp-Att-Int-Td-Yds)– Argall, 1-1-0-0, 12. Receiving (Cat-Yds-Td)– Tyler Triem, 1-12-0.